We have the best prices on all grades of tarps, tarpaulins, heavy-duty tarps, roofing tarps and poly tarps. Tarps are ideal for emergency roof repairs and general protection from the elements. We recommend the Brown Super duty tarps where a stronger tarp is needed. Large areas can be covered by joining tarps. Tarp failure can be prevented by proper tarp roping. We specialize in LARGE tarps, roof tarps and emergency roof repair items. You'll get a prompt response. 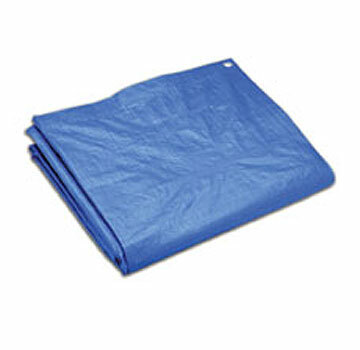 Economical Blue Tarps have high-density polyethylene woven centers, poly rope reinforced edge-hems, 30 Micron polyethylene laminations on both sides, waterproof heat-sealed hems/seams and aluminum grommets every 3 feet and in the corners. Each tarp is individually bagged. Super Heavy Duty Brown Tarps are 16 mils thick, 16x16 weave, 8 oz/sq.yard high-density polyethylene woven centers, poly rope reinforced edge-hems, UV stabilized both sides, waterproof heat-sealed hems/seams and aluminum grommets every 18" and in the corners. Each tarp is individually bagged. Available in a variety of popular sizes. Our Green Tarps are 55% stronger than blue ones. They feature 10x10 weave high-density polyethylene reinforcement woven centers, 4.5 Oz., UV resistant, poly rope reinforced hems, heavy-duty molded corner reinforcements, 50 Micron polyethylene lamination on both side, hem-stitched or heat-sealed reinforced hems and aluminum grommets every 24" and in all corners. They are also ideal for hillside coverage / erosion control. Its quite easy to strap several together. See our illustration below. Our Silver/Black Tarps and Silver/Silver Heavy Duty UV Tarps (about 215% stronger than blue ones) feature 14x14 weave high-density polyethylene reinforcement centers, 4.8 to 5 oz., UV resistant, poly rope reinforced hems, heavy-duty molded corner reinforcements, 50 Micron polyethylene lamination on both side, hem-stitched or heat-sealed reinforced hems and aluminum grommets every 18" and in all corners. The silver side reflects heat and the black underside stays cooler in the sun. ALSO AVAILALBLE: Heavy Duty Clear, extra-reinforced, fire retarded for gyms, red, yellow, 10 to 18 ounce vinyl, 10-15 ounce canvas, mesh and partial shade tarps, ice rink tarps, custom field covers and more. Email us at sales@bestmaterials.com. APPLICATIONS: Our specialized tarpaulins include tarps for house tarps, roofing tarps, truck tarps, lumber tarps, boat tarp, flatbed tarps, field tarps, grain tarps, infield tarps, trailer tarps, silver/black tarps, silver tarp, blue poly tarp, white tarp, green tarps, heavy duty tarp, polyethylene tarp, tarp cover, camping tarp, shade tarp, hunting tarps, camouflage tarps, military tarps, army tarps, roof tarps, home tarps, truck tarp systems and others. How to Tarp A Roof: Emergency Roof Repairs. A: Tom Silva replies: Basically, what you want to do is cover the damage with a woven plastic polyethylene tarp that is held in place with 1x3 wood strips. Here's how I do it. First I roll one end at least twice around a long 1x3, then screw it to the undamaged side of the roof. The 1x3 "roll" should be against the roof so it won't collect water and debris. The rest of the tarp goes over the ridge and down the other side of the roof several feet beyond the damage. Then I roll the opposite end of the tarp around another 1x3 and screw it to the roof sheathing, roll side down. Now it's just a matter of using more 1x3s and screws to hold down the tarp's sides. They don't have to be rolled in the tarp. A "blue roof" isn't pretty, I'll admit, but it will keep the weather out until someone can repair the damage. Best Materials Adds: We suggest adding Eternbond RoofSeal tape or Doublestick along the edges of the tarp and at any overlaps of two tarps. This prevents leaks. Use RoofSeal Plus for granulated shingle roofs. 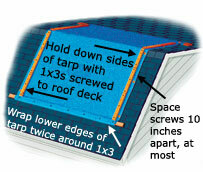 Also - where possible, wrap the bottom of the tarp around the bottom base of the roof and screw to the underside of the eaves -- water will runoff and not puddle along areas which have been screwed down. The blue tarps are really cheap, will tear easily and will degrade quickly in the direct sun. We recommend use of the Heavy Duty tarps. For smaller leaks just use the RoofSeal. A 6"-wide roll can be overlapped to create seals for larger areas of damage or missing tiles. It is simple to tarp very large areas with smaller tarps. Simply overlap the tarps and rope together using the convenient grommets. This makes easy work of hillsides, large roofs, fields, grain stockpiles, etc. On sloped surfaces, the overlapped areas behave like roof tiles and allow water to properly run off. For complete waterproofing and on flat surfaces, use aluminum faced roof repair tape along the seams. Watertight seams and perimeter seals can be easily created using Eternabond RoofSeal tape and Eternabond Doublestick. 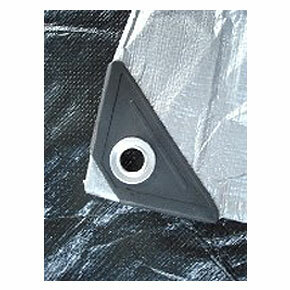 Larger tarps need to be secured with ropes woven through ALL the grommet holes, as above. The rope should run the entire LENGTH and each end of the rope then secured. The tension in the rope should be from END-TO-END of the rope. All 4 sides of the tarp are done this way. This prevents excess tarp stress under various conditions. Roping the corners and a few center areas will result in failure. The tarp manufacturers do not warrant failure due to improper tie down, over-stress or high wind. The above practice will prevent most tears.